April 20 is the 110th day of the year(111th in leap years) in the Gregorian calendar. 255 days remain until the end of the year. 1535 – The sun dog phenomenon observed over Stockholm and depicted in the famous painting Vädersolstavlan . 1884 – Pope Leo XIII publishes the encyclical Humanum genus . Year 1303 (MCCCIII) was a common year starting on Tuesday of the Julian calendar. Johann(es) Agricola was a German Protestant Reformer in the Lutheran tradition during the Protestant Reformation. He was a follower and friend of Martin Luther, who became his antagonist in the matter of the binding obligation of the law on Christians. Cassie René Bernall was a student killed in the Columbine High School massacre at age 17. It was reported that Bernall had been asked whether or not she believed in God before being shot during the massacre. However, Dave Cullen, in his book Columbine, concludes that the person asked about their belief in God was Valeen Schnurr, who survived the shooting. Eric David Harris and Dylan Bennet Klebold were two American mass murderers who killed 13 people and wounded 24 others on April 20, 1999, at Columbine High School in Columbine, Colorado. They were seniors at the high school. The shooting rampage is known as the Columbine High School massacre. Harris and Klebold committed suicide in the library, where they had killed ten of their victims. Rachel Joy Scott was an American student and a victim of the Columbine High School massacre, in which eleven other students and a teacher were also murdered before both perpetrators committed suicide. 420, 4:20, or 4/20 is slang in cannabis culture for the consumption of cannabis, especially smoking cannabis around the time 4:20 p.m. and also refers to cannabis-oriented celebrations that take place annually on April 20. 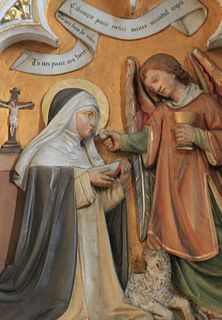 Agnes of Montepulciano, O.P., was a Dominican prioress in medieval Tuscany, who was known as a miracle worker during her lifetime. She is honored as a saint by the Catholic Church. ↑ Ranter, Harro. "ASN Aircraft accident Boeing 727-230 HC-BSU Bogotá-Eldorado Airport (BOG)". aviation-safety.net. Retrieved 2019-04-17. ↑ "Zachary Claman De Melo" . Retrieved 28 September 2018. ↑ Richard Barber (December 1992). Arthurian Literature VI. Boydell & Brewer Ltd. p. 44. ISBN 978-0-85991-226-6. ↑ Raimond (d'Aguilers.) (1968). Historia Francorum qui ceperunt Iherusalem. American Philosophical Society. p. 108. Wikimedia Commons has media related to April 20 .